What do you get when you pair the Mountainsmith Tour with the Mountainsmith Day? One of the lightest, most flexible bag combinations for traveling light! 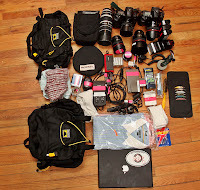 Most photographers over pack for travel. A simple overnight trip can often result in a large rolling camera case, a backpack and a full-sized checked bag. There are times you need to pack like this, but you can also scale down what you need, pack entirely based on “needs” not “wants” and do a lot with a very small packing kit. In a few weeks I will be leading a workshop taking a small group of photographers over to Hong Kong to photograph the Chinese New Year. For me, this will require approximately 18,000 miles of flying over a three day span. I will shoot extensively in Hong Kong on February 7th and 8th, including an engagement session, then photograph an engagement session in Vancouver, British Columbia, on the 8th of February. Sounds like a packing and logistics nightmare? Not at all. I have chosen my packing to be complete, compact and light and can carry everything I need in the Mountainsmith Tour and the Mountainsmith Day packs. Both bags can hold a remarkable amount of things in a very small space. Anything else I will need will be worn or carried, such as pants, belt, wallet, passport, etc etc. The three photos below show everything laid out next to the Mounatinsmith Tour and Mountainsmith Day packs, as well as the two packs full packed up. thanks for the series on mountainsmith…i’ve used one of their smaller packs for awhile and picked up the TOUR(couldn’t find pink!) based on your info. may have to get the DAY now as well. do you have a sleeve for the Mac or just cram it in? This is awesome. I’ve been trying to travel lighter and lighter as a photographer, particularly after discovering “the Strobist way.” I’m curious what you do with your cameras once you’re on the plane though. Do they just go in any extra space in the overhead bin, or is there enough space down by your legs? Great series Fish! I have an older Mountainsmith Tour and have always loved their bags. Thanks for showing us some new uses for all-purpose bags. When you fly, do you pack your bodies, or do you literally keep them on your shoulder and walk on with them? That seems to be the real killer for packing light, because it makes the bag you choose automatically larger to accomodate the bodies. The Mountainsmith bags are all built in a way which makes them versatile. This is why I have chosen them time and time again. When I fly I literally get on the plane with a camera on each shoulder. Often it is a 16-35f2.8 on one body and a 70-200f2.8 on the other body. I choose these two lenses because they take up the most space and add the most weight. Granted I will switch up my lenses at times, but those are the two most common lenses to leave out on my shoulders. Packing Canon 1D series bodies is a challenge as they are large, the batteries they use are large and the charger is quite large. This is a primary reason why I am going to be switching from the 1D bodies to the 5D bodies. I am currently playing with a 20D and hope to pick up the 5D bodies before my wedding season kicks in. Where do I place my cameras once on board? Generally I will place my cameras under the seat in front of me. It is the logical location for them. If I am on a small regional jet or turbo prop I will at times place them in the overhead. There is no where the cameras can go, thus they should not be damaged. The only “mainline” aircraft I will place my cameras in the overhead on is the Boeing 777. The overhead bin “rolls” open. The design creates a slope which would prevent a camera from falling out of them. The back wall of the Mountainsmith Day is padded and the bottom has some padding, which in my experience is where damage occurs. So with padding in the two critical places I am not worried about damaging my laptop, as long as I pay attention to how I am putting my bag down. The only damage to my laptops, besides that inflicted by my kids, has been a TSA screener. In the TSA screener incident the 12″ Apple Powerbook was out of it’s sleeve and dropped, so a case would not have helped. interesting idea. given that it has happened to you before though, i’d be worried with this setup of finding you had to check a bag for some reason (‘terrorism’, etc). that way you’d have all bases covered; your tour to ease your shooting requirements and your pelican to provide onsite lockable protection and protection in the albeit unlikely event that your kit has to be checked on the ‘plane ? I have never been forced to check two small bags. Once in US Airways I was forced to check an empty waist pouch for who the hell knows what reason, but that was a freak incident. That empty pouch was the “3rd bag” as allowed by the US DHS’s TSA, however it was over ruled by a US Airways (America West) gate agent who misrepresented herself as a Station Supervisor………when she was not. I dealt with that with US Airways Corporate Customer Service and with US Airways’ Station Manager at JFK. This kit would never get a second glance at any of the airports I am flying from, as all bags are very small and are sized well under legal carry on and “personal item” by any airline in the world (limited exceptions, such as Pan Am or Cape Air). The point of traveling with this kit is to be able to carry everything I need while shooting. If I were to travel with a Pelican case that would completely go against the carefully planned use of this set up. It would be impossible to walk though a city streets, while shooting, and rolling a Pelican case of any size. I can easily clip the Mountainsmith Tour to my waist, sling the very small Mountainsmith Day on my right shoulder, throw two cameras and on and walk around while shooting. When planning my baggage for any trip, I carefully detail not only the airlines I will be flying on, but the rules and regulations for all airports I’ll be departing from, and the type of aircraft I’ll be flying on. Knowing all this information allows me to make very educated decisions on my carry on allowance and my baggage choices. ah yes.. good point. i figure you’ll always have somewhere to leave the pelican case, but i see that’s not always the case. good call. All this talk on the tour makes me think it is the right bag to choose. I’ve gone through so many bags, it’s unbelievable. Typically on a normal assignment I just use a ThinkTank waste belt. But I also have a Lowepro bag for just my lighting. However, there is no place to attached a 70-200. I tried rigging a ThinkTank pouch on the bag, but when I walk, the lens just hangs low, so low I am afraid it will fall out of the pouch. Do you have a close image of the pouch attached? Would a 70-200 fit in the bag? 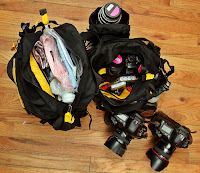 Do you ever have problems with the lens “spilling out” of the pouch when using as a shoulder bag? And any images of you carrying the gear on a typical assignment? I’ve been using a mountainsmith tour for a year now and love it. Do you add any padding??? I at times use the Domke 3-slot insert intended for the Domke F803 bag. The new version of this insert has rigid slots which makes it hard to use wider lenses, like the 24f1.4 and 85f1.2. For a while these inserts were made with movable dividers which made the insert much more diverse!